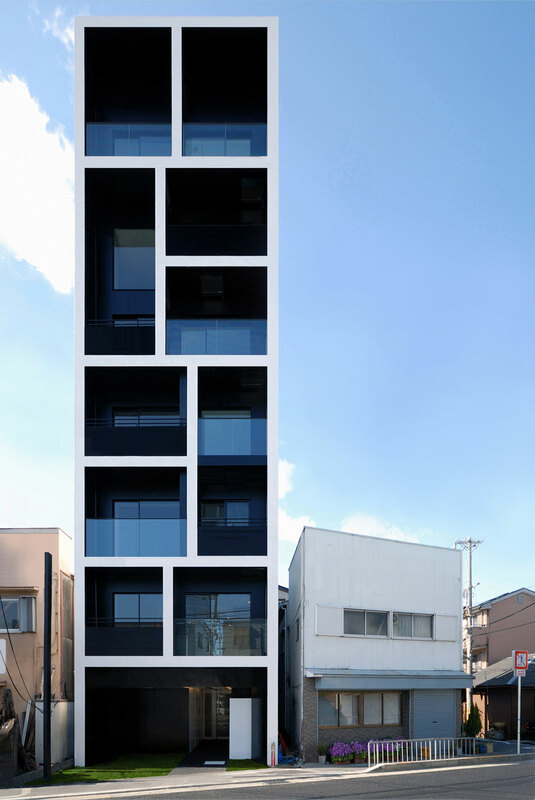 Architecture and design blog “What we do is Secret” has a great series of articles about a fantastic apartment building in Katayama, Japan by architect Mitsutomo Matsunami. Despite (or because of) the fact that the building blatantly ignores the context of its surroundings, its elegant facade and stylish architecture make it a joy to look at. And while one may argue that the project is designed to squeeze every available square meter out of its ridiculously small site, you cannot deny that it does this with incredible style. See a list of the articles about this building at “What we do is Secret”. There are structures and buildings around the world that are universally recognized as landmarks. They are of architectural importance, cultural value and historic importance, and they are beautiful even to the architecturally untrained eye. As a result of these factors, these buildings are often landmarked. Some buildings though, while boasting many of these characteristics, do not succeed in raising enough concern to be protected. This is the bitter, though still open-ended story of one of them: The Nakagin Capsule Tower in Tokyo, Japan. After World War II, Japan set out to recover from the extensive war damage and to claim its place among the industrialized nations. The rise of Japan was fast and brought far-reaching changes for both society and people’s individual lives. Like in any era of great upheavals, ways needed to be invented to deal with the new, emerging conditions. For Japan, as for all other industrialized countries, the recovery and rapid industrialization meant significant changes in the style of living: the traditional family life was eroded by the migration of young people to the big cities and the changes in the labor conditions. In this rapidly changing society, architects developed visions for future cities and the way people would live. One of these Japanese groups of architects called themselves the Metabolists. Founded in 1960, their architectural concepts dealt with the rapid economical changes and their meaning for the people of Japan. They developed theories for new cities, cities that could adopt to the constantly, and ever faster, changing conditions. They developed flexible buildings, houses that could travel to another place with their inhabitants if needed, building complexes that could expand or shrink according to demand, cities that were sustainable, with buildings made of recyclable materials. One of the leading members of the Metabolists was Kisho Kurokawa. He was also the first to turn the visions of the Metabolists into actual architecture. In his Metabolist work, he centered on flexibility utilizing ready-made parts, one of the central postulations of Metabolism. 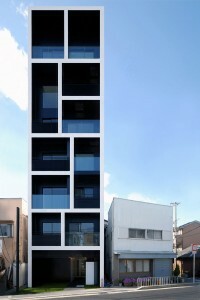 His first building utilizing these technologies, and one of the few realized examples of the Metabolist movement, is the Nakagin Capsule Tower in Shimbashi, Tokyo, finished in 1972. In Metabolist architecture, a building is made up of two components: A long-living primary structure and a flexible secondary structure. The primary structure represents the “frame” of a building, to which the secondary structure is attached or removed as needed. The Nakagin Capsule Tower consists of two tower cores, 11 and 14 stories high and connected by bridges at various levels, and 140 capsules which are attached to the towers using a sysmtem of high-tension bolts. The base of the building features the lobby as well as a convenience store. From this base, the two towers rise, executed with a steel frame and reinforced concrete. This part of the tower was built on-site. The capsules on the other hand were prefabricated at a factory and are made of lightweight, welded steel. They are based on the concept of shipping containers which was developed in the 1950’s by the US army and later modified for civil use. The capsules measure 4 x 2.5 x 2.5 meters and feature a bed, bath room, desk, TV, radio and tape deck. At the far end of the capsule, opposite to the entrance door, is a large, round window. The original concept provided the possibility to join multiple capsules in order to create a larger living space, but this option was never executed. When it was built, the Nakagin Capsule Tower served as a hotel for “salarymen”, which is the Japanese term for white-collar workers. Today it is used as a residential building. However, since its construction 37 years ago, the building has not been maintained and is slowly deteriorating. The capsules had originally been designed to last for 25 years and be replaced afterwards. This way, the living spaces would be constantly modernized, while the primary structure was built to last. However, this replacement of the capsules never happened and today the entire tower has fallen into disrepair. The constant stress has damaged the bolts that fasten the capsules to the towers. The roofs have leaks and the concrete of the towers crumbles. Adding to these circumstances are concerns of the residents about the possible use of asbestos in the tower. In 2007, the residents voted to demolish the building and have it replaced by a modern residential tower, which would provide better living conditions and larger apartments. The Nakagin Capsule Tower stands in a high-value area next to the famous Ginza district in central Tokyo, so it would be profitable to destroy the building and replace it with a new tower, which would also make more economical use of the site area. If the Nakagin Capsule Tower is demolished, it will not be the first Metabolist building to disappear: a second capsule tower by Kurokawa, the Sony building in Osaka, built in 1976, has already been demolished a while ago. Kurokawa tried to prevent the same fate from striking the Nakagin Capsule Tower, his first, original capsule creation, suggesting that all 140 capsules be removed and replaced with new, modern capsules. This plan was supported by several architectural associations of Japan, but has not been put into action. A claim to the UNESCO to file the building as world cultural heritage was unsuccessful. Finally, Kurokawa even intended to buy the building and the land it stands on from the American hedge fund that owns the tower. But then Kisho Kurokawa died of heart failure on October 12, 2007. Currently, a developer to demolish and replace the building has not yet been found. This fact can probably be attributed to the current dismal state of Japan’s economy. The future of the building is unknown. Until one or the other group can push its interests through, the building remains in a state of uncertainty. So far, no public interest in preserving the building has been expressed. It is probably the unusual (some might say “ugly”) look of the building and the fact that it belongs to a generally unloved kind of post-war architecture that has hindered people from being able to connect with this piece of architecture. And the Japanese way of dealing with outdated architecture, whether it’s just visually out of date, technically outdated or functionally obsolete, might just be different from the way the western countries cradle their historic landmarks. In a country with as little inhabitable space as Japan (70% to 80% of the country are mountainous), landmarked buildings, especially if they have lost their original function and are mere museum objects, take up valuable space that could be used in a more efficient way. In shintoism and buddhism, Japan’s two main religions, the cycle of life and death is an essential characteristic. It is symbolized, for instance, by the cherry blossoms in spring, which display their fragile beauty only for a few days before they vanish. Maybe this perception translates to other parts of life as well, such as architecture. The Nakagin Capsule Tower is a kind of building that doesn’t reveal its beauty to the passer-by, or the architecturally uninterested person in general. The building does not have a facade in the traditional sense. With the repeating cubic volumes of the capsules attached to it, it resembles an organic structure. Its beauty is peculiar and stems from its architectural and cultural meaning, from the fact that it is a built expression of the conditions and ideals of its time. Even though these ideals have not taken their place in society in the end, and society has moved on to other forms of urban living, it is still an example of a brilliant theory, a fragment of an experimental, avant-garde architecture that tried to offer new solutions for urban living in a time that required them. In this respect, it has architectural as well as historical and cultural significance and thus should be worth protecting. What about renovating the building and converting it back into a hotel, just like it was originally intented for? Capsule hotels are still popular in Japan, so there could be a market for the building as a hotel, especially in a location as central as Ginza/Shimbashi. If the current owners of the building do not intend to save it, selling it to a hotel operator that has the intentions to preserve the historical architecture and turn it into a profitable hotel might be a good solution. In the July 7, 2009 issue of the New York Times, an article by the paper’s architecture critic Nicolai Ourousoff portrayed the Nakagin Capsule Tower and its fate. He sums up the architectural importance of the building as follows: “The Capsule Tower is not only gorgeous architecture; like all great buildings, it is the crystallization of a far-reaching cultural ideal. Its existence also stands as a powerful reminder of paths not taken, of the possibility of worlds shaped by different sets of values.” He concludes the article stating that the destruction of landmarks like the Nakagin Capsule Tower and other buildings of similarly high value and low public and political interest is “not only an architectural tragedy, it is also a distortion of history”. It remains to be seen whether the wind for Nakagin will change or whether economical decisions will seal the fate for this prime example of post-war intellectual Japanese architecture.